Bill Hutchinson's departure from the Daily News comes at an uncertain time for the New York tabloid. At the New York Daily News there is a tradition that when a long-time reporter or editor leaves the paper, the entire news staff stands and applauds as that person exits the newsroom for the last time. That bittersweet gesture was invoked again Thursday night as Bill Hutchinson left the paper after 17 years on the tabloid's dwindling rewrite desk. The departure of "Hutch" had some added overtones. It comes at a time when the future of the money-losing paper is uncertain. Owner Mort Zuckerman has put the paper up for sale, but has been mum on who -- if anyone -- is seriously offering to buy it. The paper's growing reliance on its website -- which has no resemblance to its print edition -- was on stark display. As Hutchinson left to a standing ovation from his print colleagues, the digital staff stayed in their seats, either unaware of the tradition or of Hutch's contribution to the paper. These two elements were noted when the staff retreated to Fraunces Tavern in lower Manhattan to toast Hutchinson and present him with his personalized front page, another Daily News ritual. It's a gathering that routinely draws others who were applauded in previous years, and they reminisnce about old front pages known as "woods," and their current jobs outside of newspapers. In the dark recess of one of Fraunces' back rooms was a sight that is growing less frequent and smaller -- a gathering a real newspapermen and women. 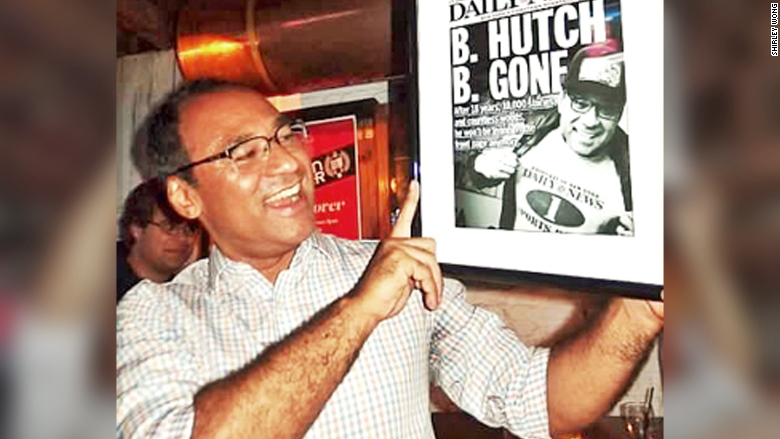 Hutch rejected the idea that the Daily News, which proclaimed itself "too tough to die" when it escaped an earlier near-death experience, would sink under the weight of digital economics. His declaration was profanely seconded. But the spectre was in the room. There were only rumors of a buyer for the Daily News. Hutchinson's rewrite colleague Corky Siemaszko said Thursday night that he tries to ignore the uncertainty. "I just come in and do my job," he said. It's a job they clearly love more than most people love their work. In a farewell note, Hutchinson wrote, "I watched the Twin Towers fall, and the Freedom Tower rise, survived the blackout of 2003, saw Yankee Stadium and Shea Stadium demolished and rebuilt, endured the aftermath of Hurricane Sandy. All these experiences, these milestones, have formed the plot of my own potboiler.... After more than 10,000 bylines, an estimated 2,000 woods, nearly two decades of doing battle in the trenches of a topsy-turvy tabloid war, it's time to put a wrap on this amazing assignment." Hutchinson, 53, is joining the staff of the San Francisco Chronicle. Mark Mooney is a former national editor of the New York Daily News.